Homepage > News > 4CP > It's Mudbug Season! 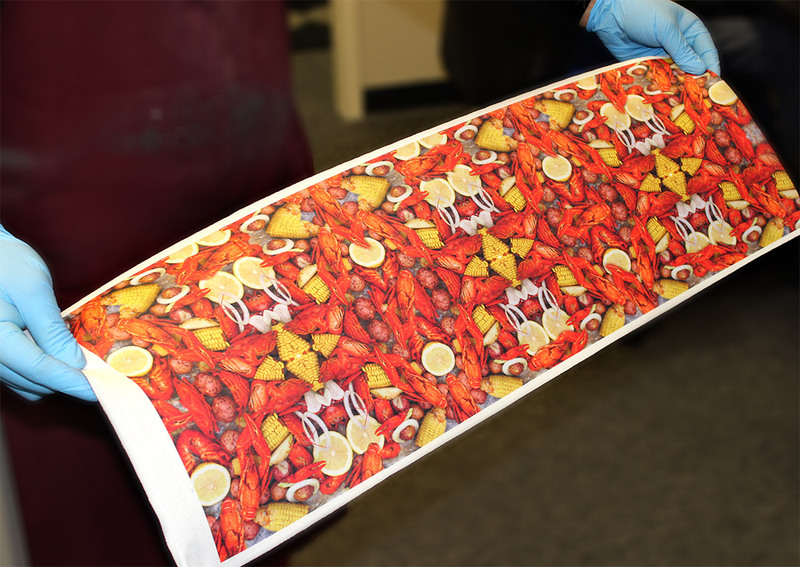 Crawfish season is in full swing, and here at the AZL factory we’re cooking up some mighty tasty products. From our durable plastic Stadium Cups, to decorative Frio Socks folks are really pulling out the stops and going all out for their cook-outs and crawfish boils. Of course, the real star of the season, without a doubt, is our own signature Crawfish Crazy Frio (CF2-CRAW). Whether it’s a 1-color screen printed Sock or the full-color, full-coverage imprinted 4CP Frio, our clients just can’t get enough of them (much like the mudbugs themselves)! And with a couple more months of the season left there’s still time for you to get your order in for your very own Crawfish Frio Socks! Getting hungry? Our 4CP Tech “Chef” Freddy showing off another batch of mudbugs, er, a sample piece of fabric. Crawfish are really big deal in the South, as anybody down here would know. But, even if you’re not here in the South our Crawfish Frio can just as easily represent a Lobster. And we know Lobster Season is around the corner, so give us a call and we’ll help you get ready for that big lobster boil you’ve been planning. Send in your logo, and if you want full-color you can send in your graphics too. Whatever you’re craving our team of printing “chefs” can “cook” it up for you!